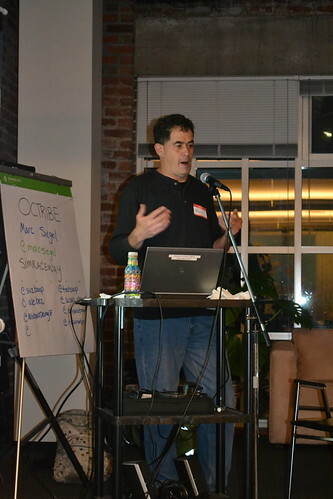 In April, the Online Community Meetup welcomed Marc Siegel, manager of customer and community at IgniteGT / Simraceway. Siegel’s talk, Human-Centered Aspects of Community Management, looked at tactics communities managers can employ to bring a human touch to build and maintain online communities. Siegel's lessons for community management drew on his experience managing communities of all kinds, having worked with companies such as NASA and IBM. Siegel began by outlining the basics of online communities, namely, that they grow out of interest in a topic and flourish because of relationships. Online relationships are built if all interactions happen with the recognition that behind an avatar/handle lies a person. Building online communities requires giving members opportunities to talk openly about themselves and be recognized. Providing “about me” forms with open-ended fields and recognizing unique, or newly updated profiles are ways to do this. Communities also grow because there is genuine communication between members, volunteer leaders, and community managers. Productive dialogue requires honesty, openness to constructive criticism, and inclusion. Members of a community are not all the same – they go through a cycle defined by their participation. Recognizing where your members are at, what their needs are, and encouraging their growth are important for community managers. The first level is the visitor, who has not fully committed to the community. Turning them into a novice, the next level, requires special treatment such as an official welcome or gift. Welcoming new members is a good role for a regular – an active community member who can be entrusted to serve as volunteer leader. Over time, active members will become elders – members that should be especially recognized and respected. Elders are experienced members who help transmit the community’s culture and share knowledge to all other members. However, before you have active or elder community members you have to create the community. Our real world natures inform our online interactions – and like the buffet line at a wedding, no one wants to go first. To grow a new community, managers will have to seed the community. Seeding a community is possible through creating and answering questions in forums and/or creating dummy accounts to help spur initial discussion. Creating some interaction eases comfort and encourages conversation. Providing open-ended answers, asking questions, and not responding immediately so members can help each other can also encourage conversation. In a healthy online community, members can be relied upon for input. Community input can help make the community better, and even guide product design. However, community input doesn’t always tell the whole story – this is where analytics are useful. Your analytics give an unbiased account of what resonates and what doesn’t work. Relying on analytics may seem counter-intuitive but is not because it gives a sense of how the entire community behaves. Relying solely on input can overshadow quieter or newer members of the community who don’t feel comfortable openly expressing themselves. If you missed this Online Community Meetup, please visit our online page and RSVP for a future meetup.